If I’m asked from someone, “What meat do you like best?”. I’ll answer, “chicken!”. I love chicken. Especially, yakitori ! I want to eat yakitori at lunchtime, too. But not many yakitori and chicken restaurants serve yakitori (bowl) at lunchtime. Mostly they serve oyakodon. So, when I find yakitori on lunch menu, I’m glad. I found Isehiro serve yakitori bowl at lunchtime. So, I wanted to visit there for a long time. But Isehiro’s lunchtime is weekdays only. So, I took a day off for that. There’re some branches. 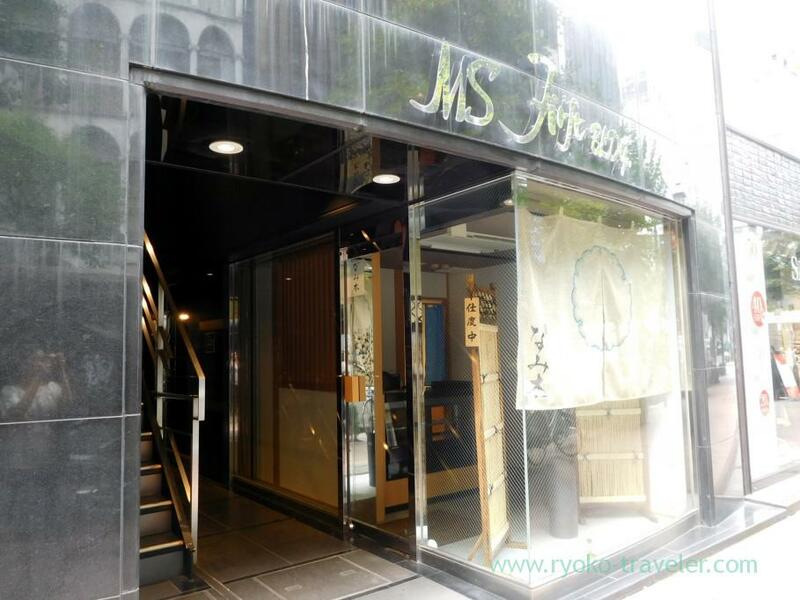 I visited Isehiro Ginza branch. 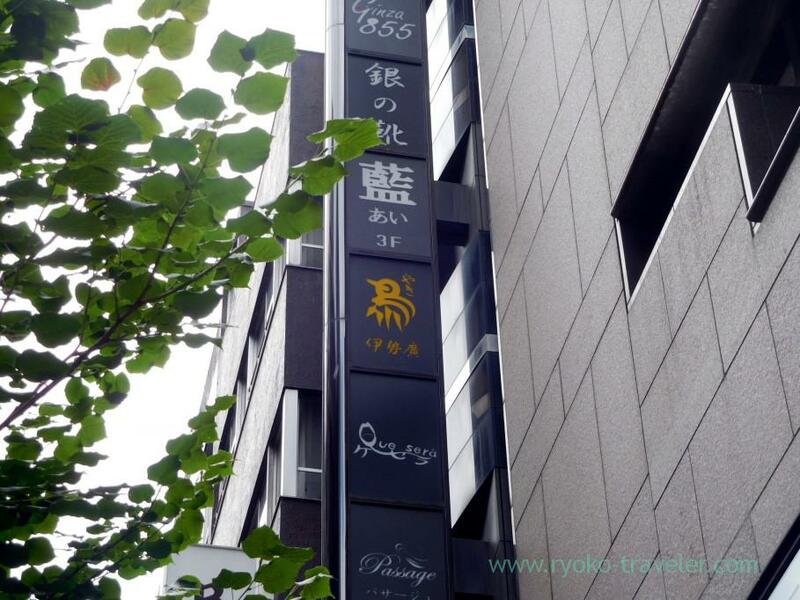 Isehiro is on the 2nd floor of the building. Isehiro has started their business in 1921. 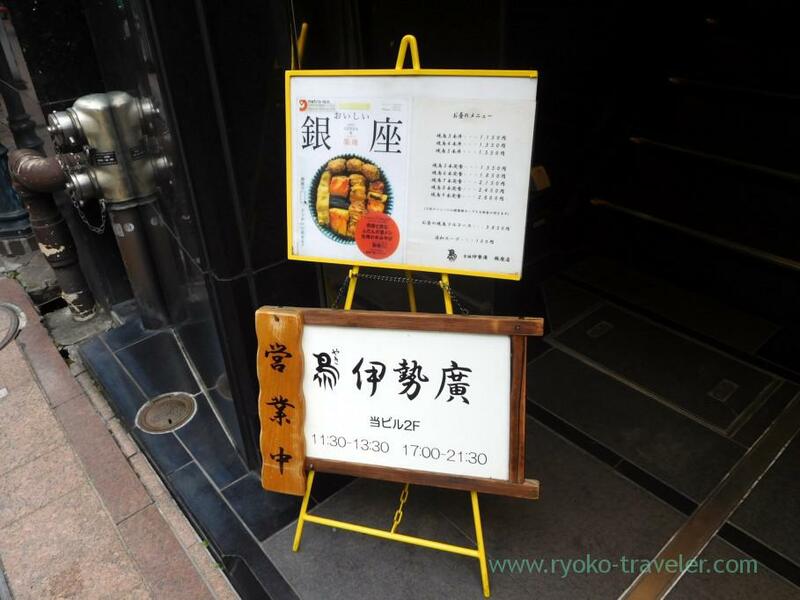 Long-established yakitori restaurant. The head shop is located in Kyobashi area. There’re counter seats surrounding kitchen. We can see yakitori charcoal-grilled in front of us if we are seated there. Fun ! There’re also tables, but they don’t have much seats. They put their lunch menu outside after the opening time. But if you visit there before the opening time, nothing is there. So, it might be hard to find. So if you visit there before the opening time, watch above. There’s a signboard at the side of the building. “鳥” is the signboard of Isehiro. They serve yakitori only at lunchtime. They don’t serve oyakodon. Yakitori bowl cost you from 1150yen (3 sticks) to 1550 yen (5 sticks). 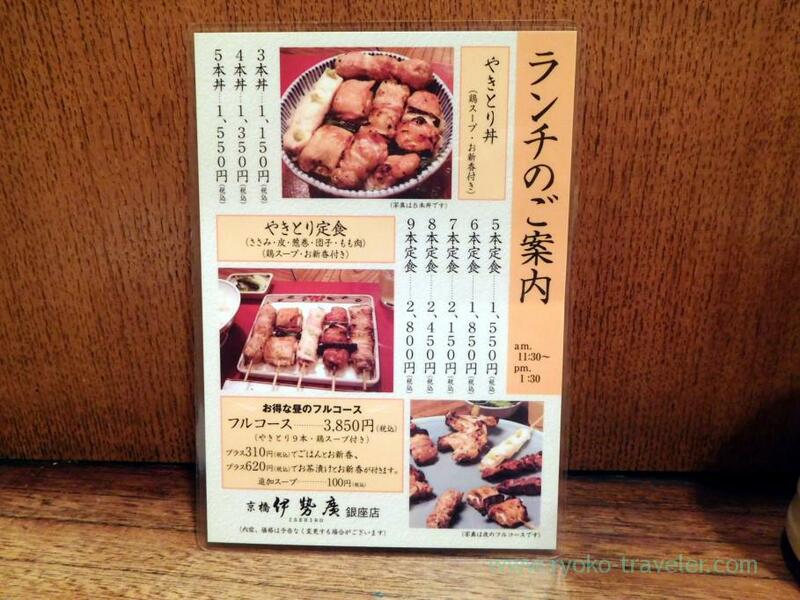 If you want to eat more yakitori, they have yakitori set from 1550 yen (5 sticks) to 2800 yen (9 sticks). 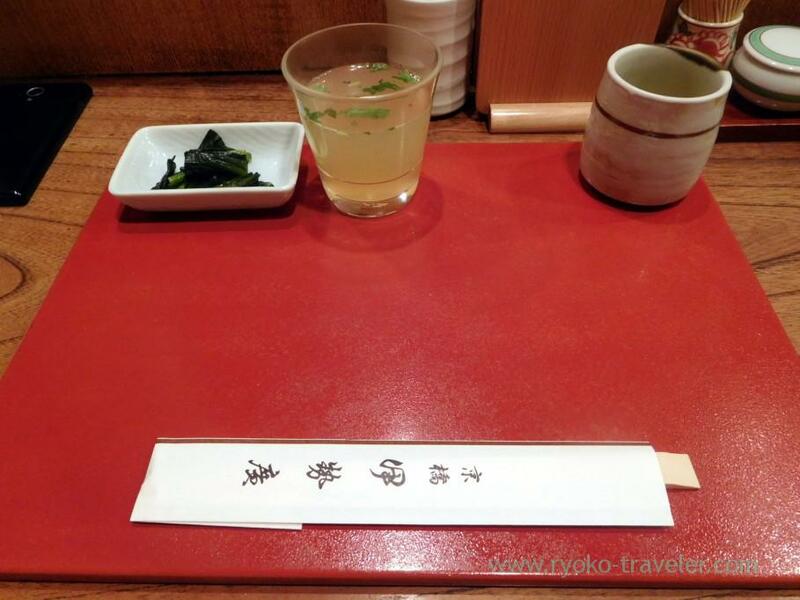 The chef started cooking yakitori after they took order. And pickles and chicke soup was served on the red tray. Chicken soup is served in a glass. The color is nice. And it had abundant flavor of chicken. It had plenty of chicken extracts. Delicious. 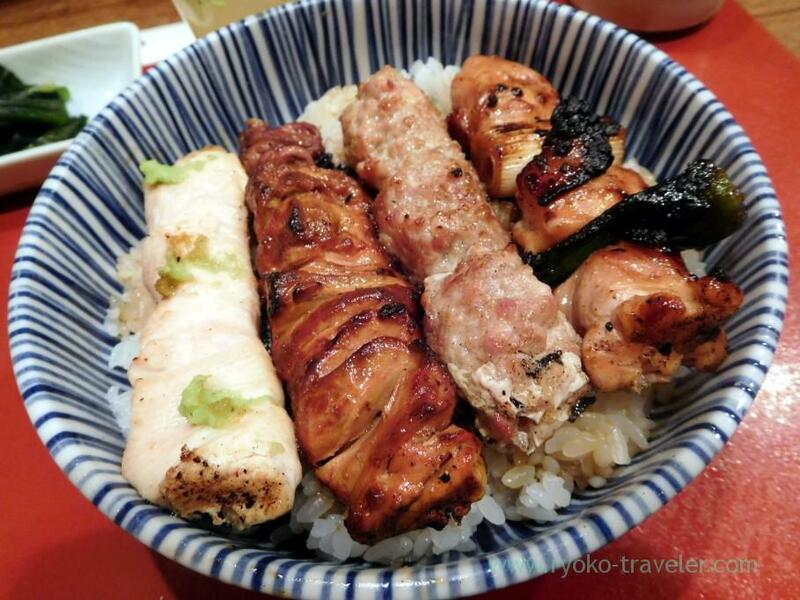 I ordered 4 yakitori bowl (1550 yen). This set have 4 yakitori. 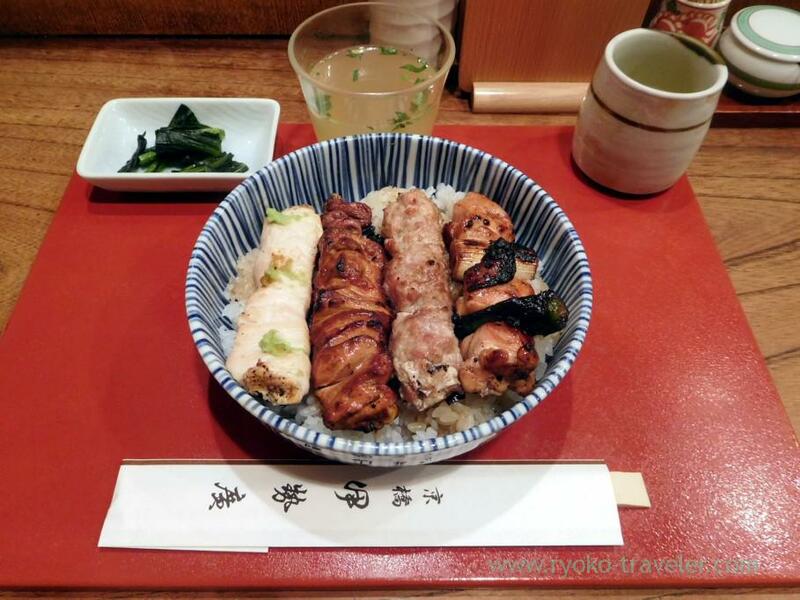 Sasami (= Chicken breast strips), round meat, tsukune and negima (= Chicken meat and green onion). But we can change another one when they take order. I said “Change round meat to liver”. 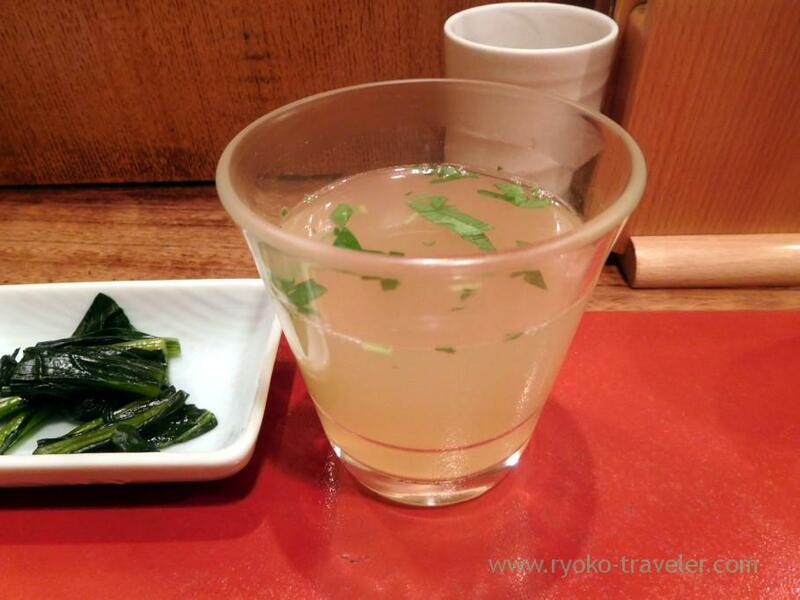 Salted sasami with wasabi had light tastes. and inside of the liver is medium rare. Salted tsukune had crunchy texture. The meat of negima had springy texture. Everything was good. Much sauce was put on the rice. But it was not too sweet and was my tastes. Though Ginza branch and Ginza 5-chome branch is open at lunchtime weekdays’ only, Kyobashi head shop is open on Saturdays lunchtime, too. I heard the historic architecture of Kyobashi head shop is great. So, I want to visit there all the same. Of course, I need 6 sticks of yakitori next time. Open / 11:30 a.m. – 1:30 p.m., 5 p.m. – 9:30 p.m.